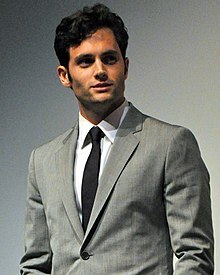 پن بدجلی (اینگیلیسجه: Penn Badgley) آمریکالی موسیقی‌چی و اوْیونچو. ۱ نوْوامبر ۱۹۸۶ ‏ ایلینده آمریکادا دۆنیایا گؤز آچیب. 1997–گۆنوموز ایللر آراسیندا سینما ساحه‌سینده چالیشیب. ↑ Twenty-Second Annual Young Artist Awards 1999-2000. Young Artist Foundation. ↑ 2008 Teen Choice Awards winners and nominees. Los Angeles Times (June 17, 2008). آرشیولنیب اصلی نۆسخه‌دن on September 12, 2008. یوْخلانیلیبJanuary 4, 2018. ↑ Teen Choice Awards 2009 nominees. Los Angeles Times (June 15, 2009). یوْخلانیلیبDecember 28, 2012. ↑ ۴٫۰ ۴٫۱ Soll, Lindsay (June 14, 2010). Teen Choice Awards 2010: First Round Of Nominees Announced. MTV. آرشیولنیب اصلی نۆسخه‌دن on June 6, 2012. یوْخلانیلیبDecember 28, 2012. ↑ ۵٫۰ ۵٫۱ Teen Choice Awards 2011 Nominees Announced: Harry Potter vs Twilight. The Huffington Post (June 29, 2011). یوْخلانیلیبDecember 28, 2012. ↑ "Descendants," "Martha Marcy" Lead the Fox Searchlight-Friendly Gotham Award Nominations (October 20, 2011). یوْخلانیلیبJanuary 4, 2018. ↑ Kaufman, Amy (February 26, 2012). 'The Artist' wins best feature at Independent Spirit Awards. ↑ Teen Choice Award Nominees 2012. Huffington Post (May 18, 2012). یوْخلانیلیبMay 19, 2012. ↑ Lewis, Casey (May 22, 2013). Teen Choice Awards Nominations Announced! Who Made The Cut This Year?. ↑ Winners 2016. Manchester Film Festival. ↑ OFFICIAL SELECTION 2016. Oxford International Film Festival. اینگیلیسجه ویکی‌پدیاسی‌نین ایشلدنلری طرفیندن یارانمیش«Penn Badgley»، مقاله‌سیندن گؤتورولوبدور. ( ۲۲ ژانویه ۲۰۱۸ تاریخینده یوْخلانیلیبدیر). قارداش پروژه‌لرده پن بدجلی گؤره داها آرتیق بیلگی‌لر تاپابیلرسینیز.